Who says you can’t control the weather? Let’s make it rain in Photoshop. 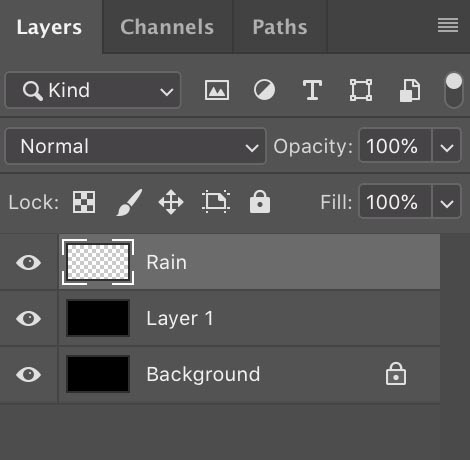 I will now walk you through the steps for creating realistic, animated rain in Photoshop, one drop at a time. Watch the video to see the steps as well as the results. 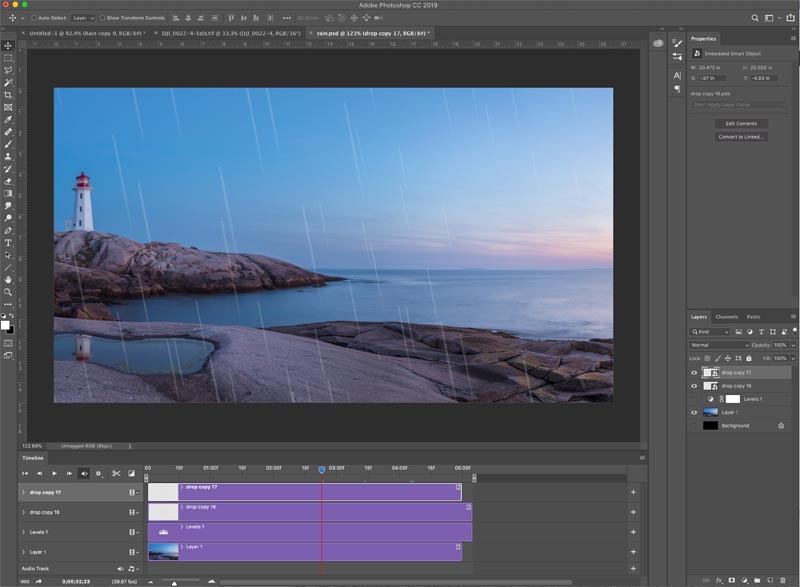 For those who ask “why not do it in After Effects?” I have also added an After Effects, make it rain tutorial at the end of the video. 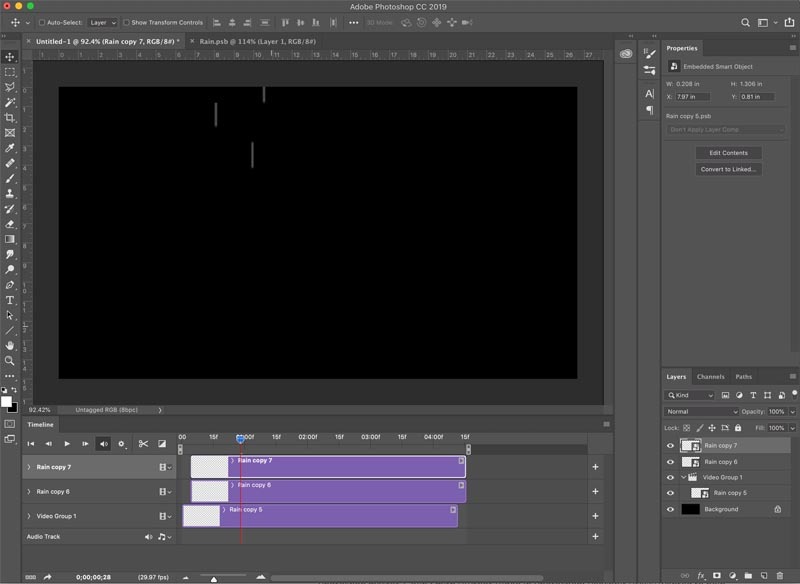 To make it rain in Photoshop we are going to make a single drop and animate it. Then, Ill show you how to leverage smart objects and nested animations to create a complete downpour. Let’s start by making a raindrop. Remember though, it needs to be a streak with motion blue to look effective. So, we are actually making a dash. Start with a new document, I made it 1920×1080 do it will work for HD Video. 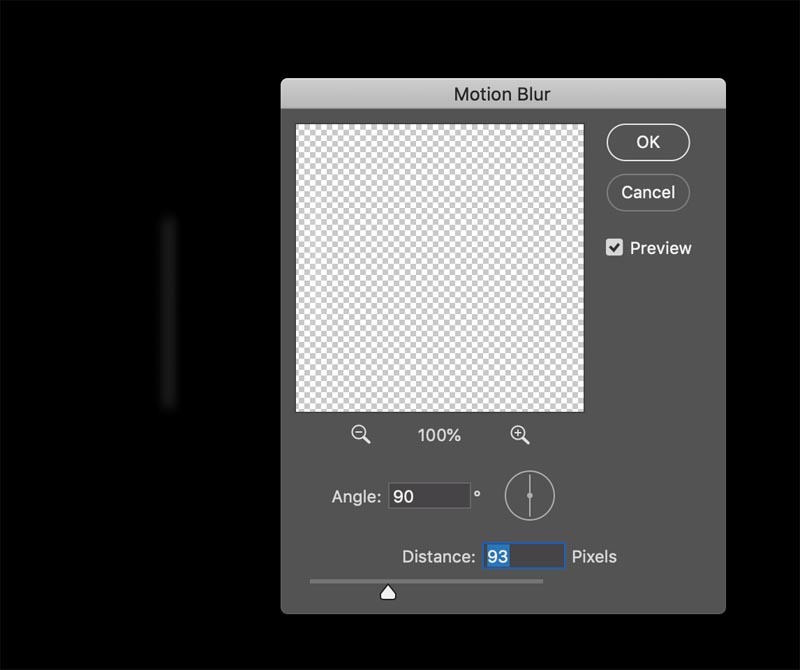 Choose Filter Blur>Motion Blur set it to around 93 distance and choose 90 for the angle (It will be much easier to animate in at 90deg and rotate the result later, than to try and animate in at an angle. 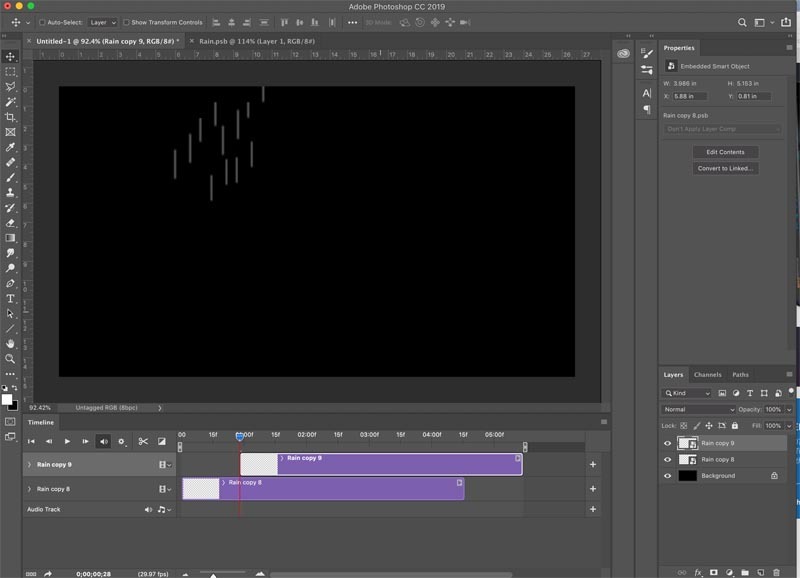 I’ve seen other tutorials where they animate the angle and the rain looks like it sliding sideways, not a good look. 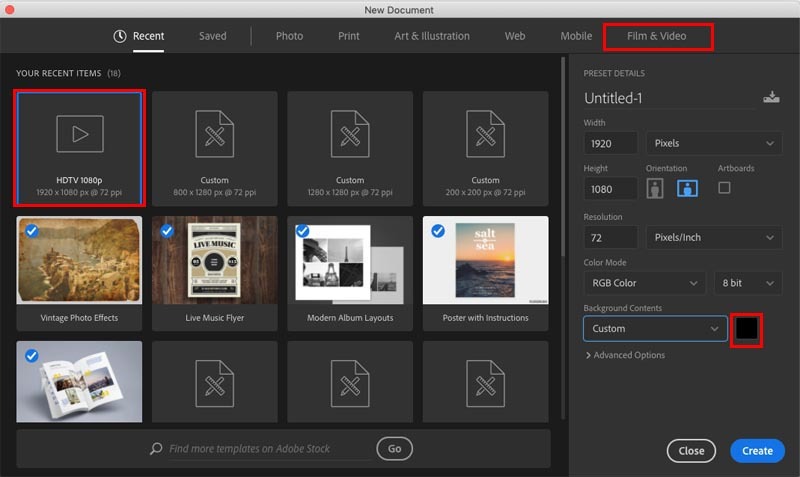 Double click the Smart Object in the layers panel to open it in a new document. Choose Window>Timeline to open the timeline. In the document window, move the raindrop to the top, so it’s just off the screen. This is the start of the animation. Move the playhead forward to a little less than 1 second (Changing the timing and other details are in the video above if you need more help). Holding down Shift to constrain the movement to perfect vertical, drag the raindrop to the bottom, just out of sight. Hide the black layer )it was just a guide so we could see and also to force the 1080 HD size. 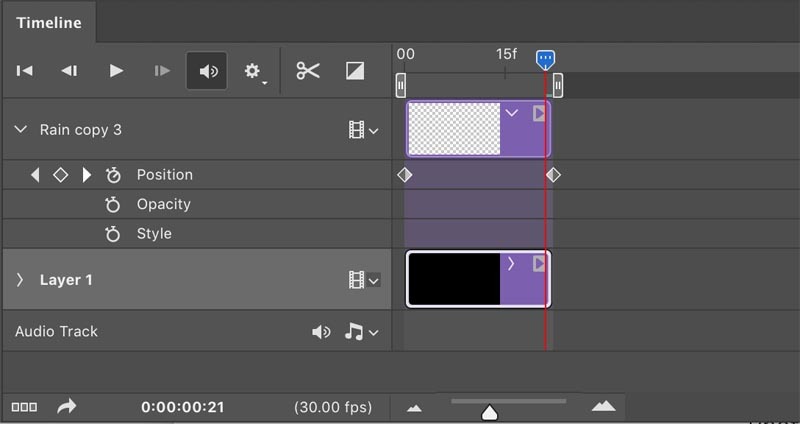 Drag the right side of the timeline layers to the left to match the length of the animation. 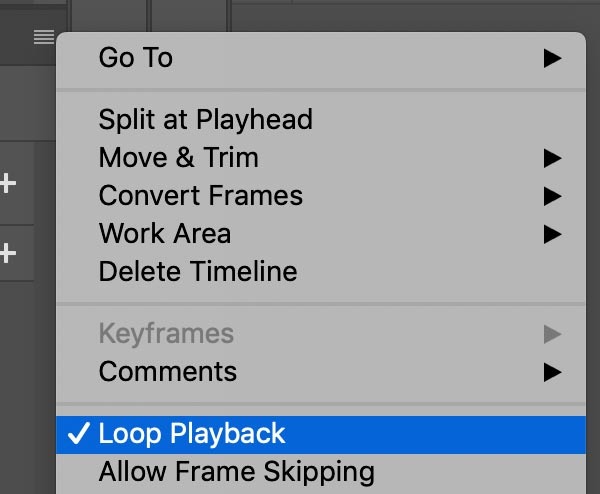 Make sure looping is turned on tin the menu at the right top of the Timeline. Press Ctrl/Cmd+S to save the Smart Object changes and close the window. Step 4. Extending the rain. Now it’s time to copy the drop and make the animation last longer. 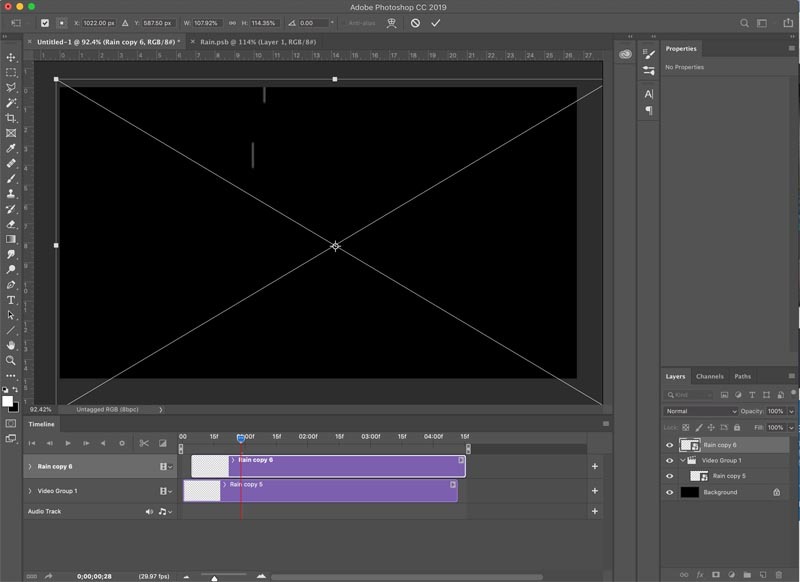 Open the timeline and press “Convert to video animation” from the timeline. Choose the rain Smart Object and Press Ctrl/Cmd+J 2x to duplicate it twice. 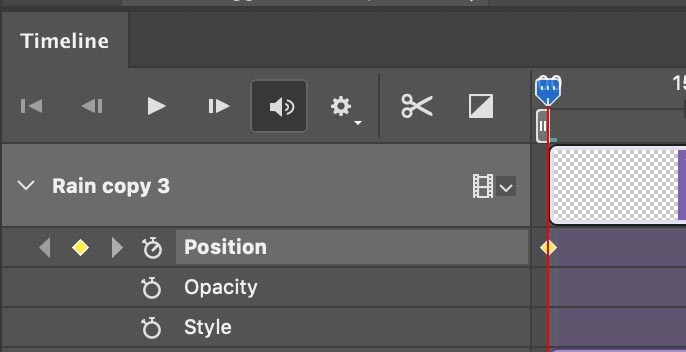 Drag the clips to Position the clips one after the other. It will now play through 3 times. Let’s double it. 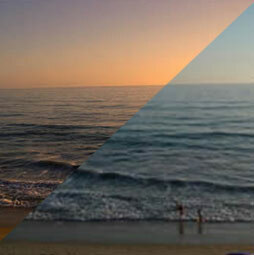 Click, Shift + click to select all 3 layers that are smart objects. Press Ctrl/Cmd+J top copy them. You will now have 6. This is long enough. Make sure they are all together in the timeline. Step 5. Turning a drop into a downpour. Now it’s time to multiply the drop and make more rain. (Note: Your computer will be taxed by this process and start to slow down, this is expected). 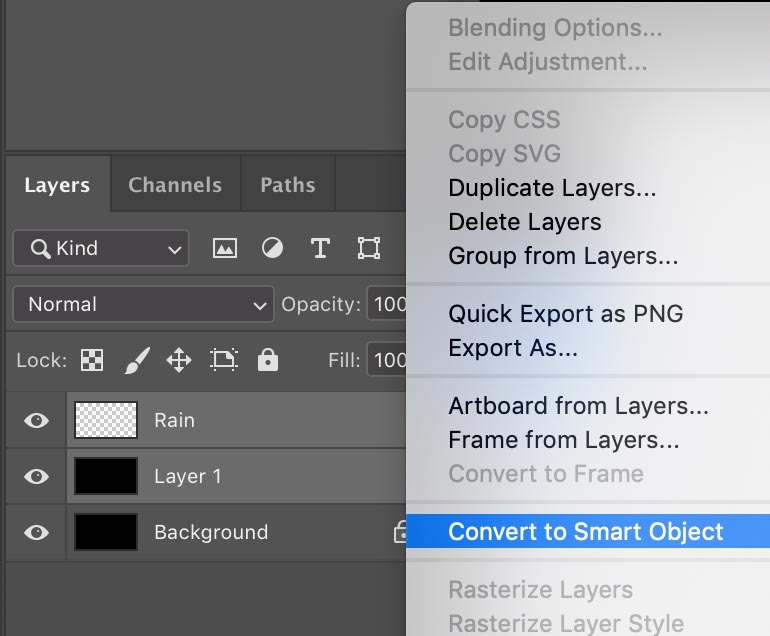 Select all 6 smart object layers and right-click on the layers panel and choose Convert To Smart Object We have now nested them into a single object, which is easier to manage. 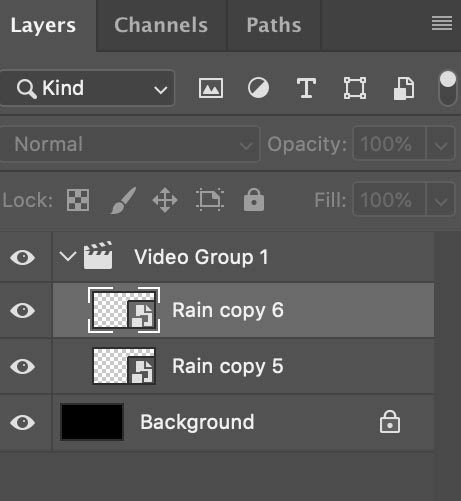 Drag the copied smart objet out of the Video Group in the Layers panel, Drag near the very top of the layer stack, until you see a thin white line. Let go. 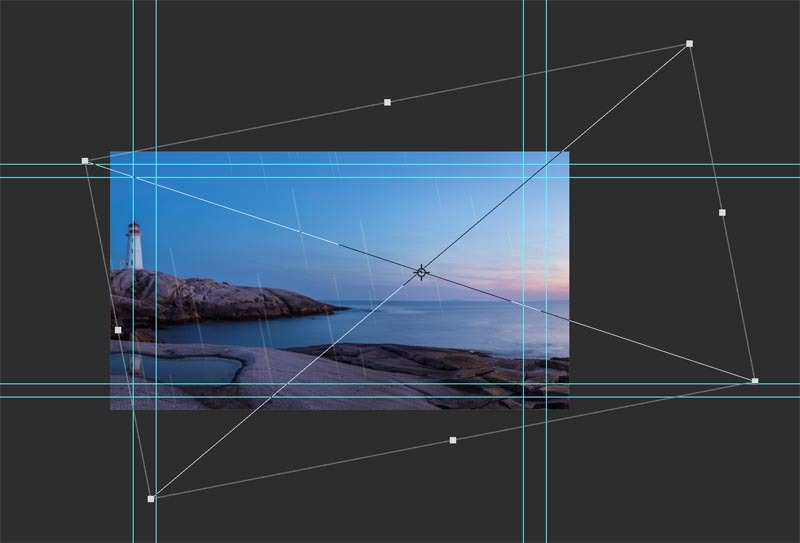 Now drag the top layer to the left tin the timeline so its at the start of the timeline on a second layer as shown here. Press Ctrl/Cmd+T for free transform. Drag a corner to make the new drop larger than the previous one. This will also stagger the timing a little bit with the larger one appearing to move faster, which is how they behave in real ilifes because of perspective. At this point, all we need to do is keep duplicating the result, and build up the rain.. as so..
A. Press Ctrl/Cmd+J to copy the smart object. reposition and stagger timing. C. Press Ctrl/Cmd+J to copy, repeat. As you can see, each time we duplicate, we are doubling the rain. It’s starts off slowly, but you will very quickly start to get very dense rain. 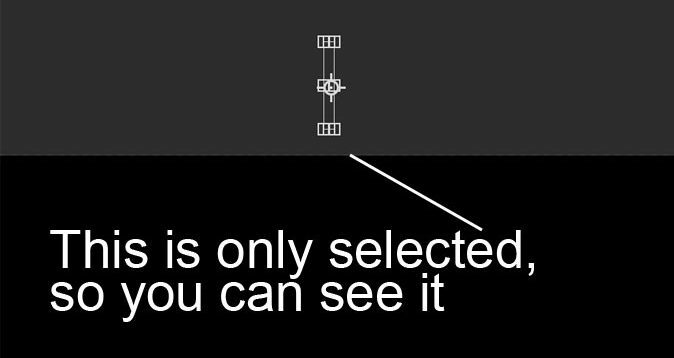 Select the smart Object . Press Ctrl/Cmd+T for free transform. Drag outside a corner handle to rotate the the rain to place it at an angle. The steeper the angle, the stronger the wind. Change to Lighten Blending Mode (Get my free ebook on Blending Modes) and drop the opacity down to around 25% and place a video or an image underneath to see the effects. Now we have made the rain, we need to export it, so we can use it. Now we have 2 options. A. 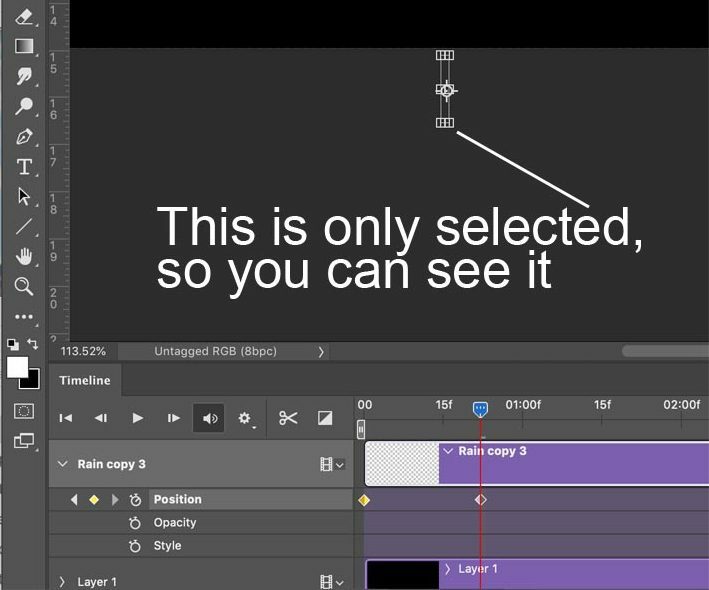 If you have completed the animation in Photoshop. 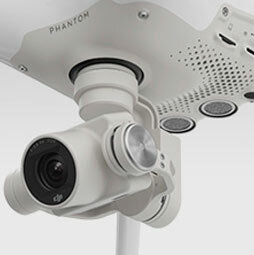 meaning the image or video is beneath the rain and ready to go, Choose Export>Render Video. 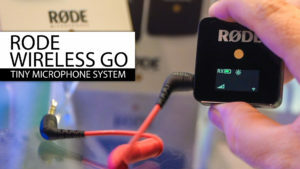 choose the presets and select youtube 1080. Select a destination and choose render video. B. 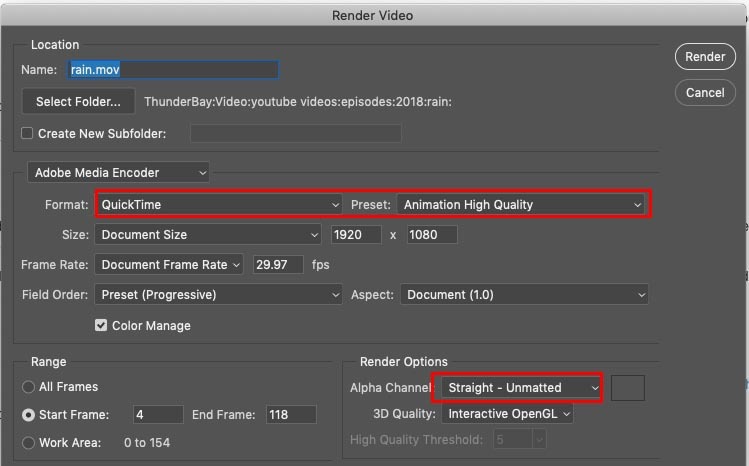 If you want to use the rain in Premiere Pro etc or overlay it as a video, do this. Turn off the black layer. 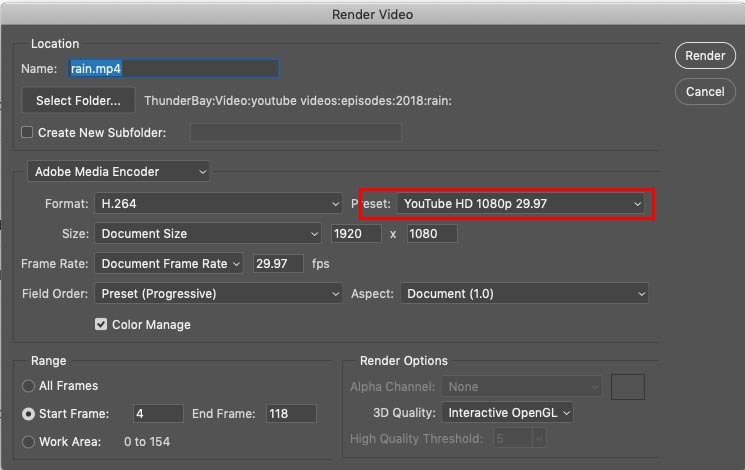 Choose Export>Render Video. Select Quicktime Video and Animation Codec. Make sure you choose Straight Unmated from the matting options at the bottom to show transparency. 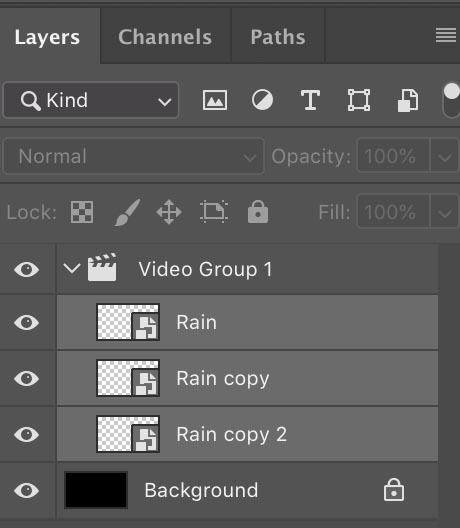 This process is much easier in After Effects, because it has a rain filter built in. I hope you enjoyed this little video and are having fun with the world of Photoshop and Animation. 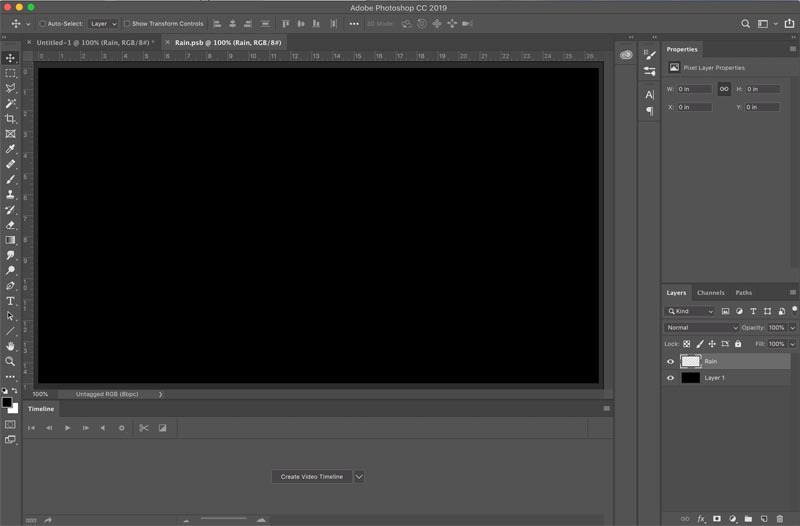 I have another tutorial here that shows you how to make animated snow in Photoshop. 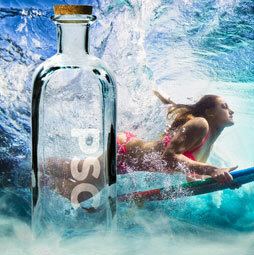 I have 2 Video courses I created for PhotoshopCAFE. Thanks for checking it out. 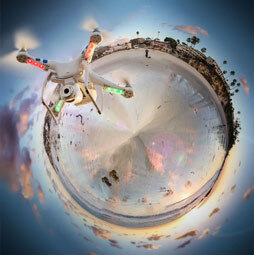 Drop a comment and don’t forget to sign up on the PhotoshopCAFE list for free goodies and tutorials from me each week. Just thought you should know of the typo. LOL! thanks for the heads up! Well, this tutorial inspired me so much I went over to your other ones and picked out the snow animation one. Spent an hour making an animated snow Christmas card out of one of my paintings to post on Facebook. Looks great. Thank you so much for sharing your hard earned knowledge, it is greatly appreciated. Just wish I could have worked out how to make the Christmas bauble swing as well. COLIN!!!!!!! AWESOME TUTORIAL!!!! I LOVE IT!!!! Thanks a million and never stope the fun and incredible work. I am one of the 90+% of people who use a PC. Not just because those are my initials, but because I can run more programs, run them the way I want to do, (instead of the way Apple tells me too) and can do it for less than half the cost. In my eyes, Apple has no advantage over the powerful Microsoft platform in Photoshop, Illustrator or any other graphics programs. It all comes down to user preferences and Apple is for all the rebels who want to be different. Go ahead, let Apple tell you what to do and how to do it. I will be just as productive, just as detailed and just as good as any 3000 dollar Apple computer on my 500 dollar PC. Apple being, “better” at anything is a myth.